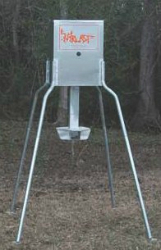 This feeder will surely be a hit with everyone except the raccoons, as they simply won’t be able to reach out and touch your feeder, as they have been able to in the past. This newly designed galvanized hopper features a full internal funnel, a site glass, varmint-guard legs which are pinned for safety, and our heavy-duty 12-volt Control Unit, which features our Digital Timer Control. All of these new features wrapped up in one feeder make it pretty unique amongst the competition.